It is difficult to find a better sweet treat for a September afternoon than a plum cake! If you are lucky to have a garden and a plum tree yourself, then you know how generous nature is in sharing this yummy fruit. At times there are so many of plums from one single tree that you have no idea what to do with them – so let us give you an idea. A combination of chewy crust and a delicate plums filling create a delicious dessert, which can be enjoyed warm or cooled, at any time of the day. Our recipes is suggesting you a healthier and easier version of a traditional plum pie – without compromising its taste. 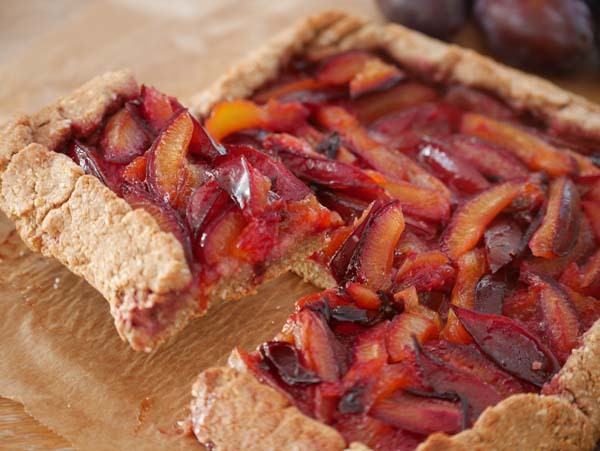 Try our plum pie recipe and let us know how you liked it! Step 1. Whisk eggs together with the sweetener of your choice. Step 2. In a separate bowl, mix whole wheat four, grated coconut and baking soda. Add ghee, whisked eggs and mix together nicely. Step 3. Knead the dough for couple of minutes, roll it into a bowl and put in the fridge. Step 4. Prepare your filling. Pit the plums and cut into six peaces each. Mix with grated jaggery in a sauce pan and bring to boil. Keep boiling for 2-3 minutes, until plums become soft, but before they start loosing skin, and put aside. Step 5. Take the dough out of the fridge and roll into a a desired shape (square or circle, whatever you prefer). Step 6. Spread the filling on the dough, leaving about 1.5 cm on the sides. Then fold the sides of the dough (like in the picture), so that the filling stays in place. Your delicious plum pie is ready! Enjoy with a cup of coffee or tea on a fresh autumn afternoon.